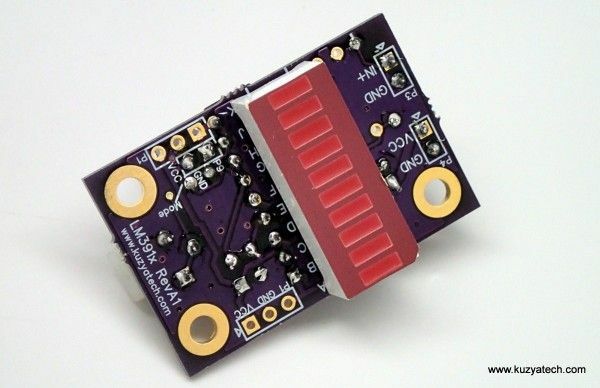 This kit builds on a famous LM3916 VU bargraph driver chip from TI/National semiconductor. The chip is essentially a constant current 10 segment driver fed by an array of comparators. It also provides internal reference voltage to set the rail of the precision resistor network feeding the comparator reference inputs. A signal coming in then determines how many signals are lit. Depending on the mode selected, either bargraph or a single dot is displayed. This particular kit is using LM3916, optimized for audio meter applications but could also be used with LM3914 and LM3915 parts to get linear and log response respectively (mainly set by the individual resistance values of internal divider networks). Jumper P5 enables bargraph mode when installed.